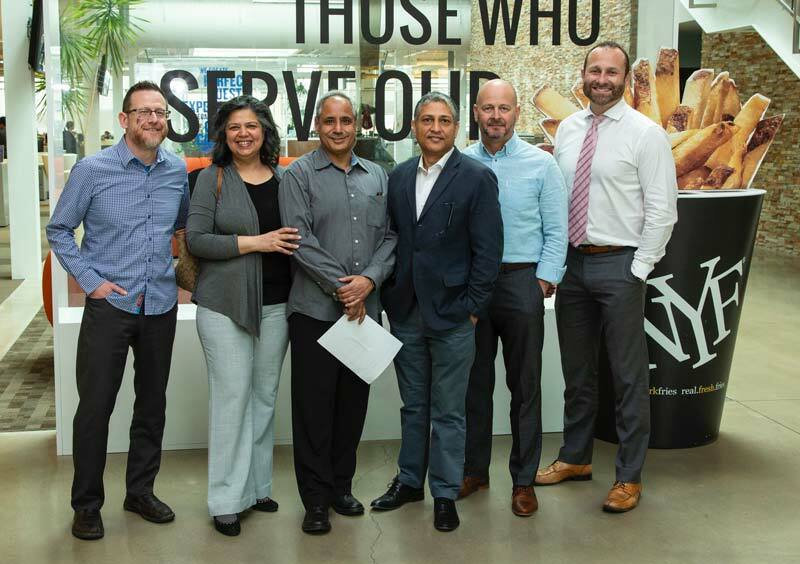 From left: Craig Burt, vice-president of New York Fries; Anita Vasisht, franchisee; Naveen Vasisht, franchisee; Shailendar Kaushik, franchisee; Peter Goodman, senior business development manager; and Courtney Hinderoff, director of franchising with Recipe Unlimited Corporation. “We have had India in our expansion plans for a while but were waiting for the right partner to bring New York Fries to the Indian market,” said Craig Burt, the company’s vice-president. The New Delhi restaurant is part of a multi-unit deal with franchisees Naveen and Anita Vasisht, Shailendar Kaushik, and Sameer Sharma. The partners, who have franchising experience with New York Fries sister brand Montana’s BBQ & Bar, plan to open 35 locations across Northern India in the next five years. Established in Brantford, Ont., in 1984, New York Fries was acquired by Cara Operations (now Recipe Unlimited) in 2015. The QSR has 165 units across Canada, as well as 45 international locations in China, the U.A.E., Macau, Saudi Arabia, Bahrain, Oman, Qatar, and Panama.